In a town where good food is celebrated, cooking schools abound. There was a time when Institut de tourisme et d’hôtellerie du Québec, the professional chef school, was open to the public. While its teachers relished the opportunity to share their food mojo in a more fun-driven, relaxed atmosphere, those days are over, I’m told at the request of the Quebec Government. • And last but not least, La Guilde Culinaire which opened its gourmet boutique/state-of-the-art cooking school two and a half years ago. 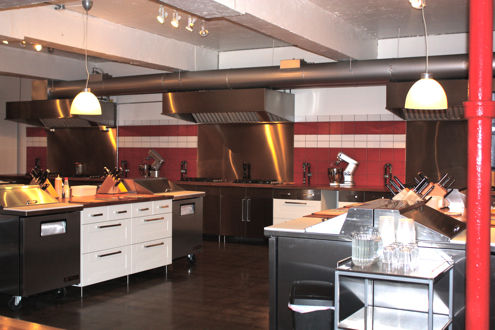 The kitchens at La Guilde Culinaire are breathtaking with their gas stoves, lethal knives and trendy decor. Oh, the food and expertise are even better. Of course this list does not include all of Montreal’s cooking schools, only the ones I know because I or friends of mine have been, or because their reputation speaks for itself. Much like La Guilde Culinaire where I was recently invited to take part in a Sushi 101 class. Cool. I fell in love with sushi in the early 1980s (which gives you an idea of how ancient I am), when Sushi Bar opened on St. Denis Street. I still remember how when the waiter placed my very first sushi platter in front of me, I took one whiff and turned to him with crazed eyes to order a whole bottle of sake. For me alone. I figured I needed to get badly drunk if I was ever going to eat that. Yet two, three months later, I found myself lingering on the whole experience, the pretty decor, the beautiful porcelain dishes, the visual poetry of futomaki, and the unique taste which maybe wasn’t that bad after all? And so I went back, a sushi addict in the making. Sushi class at La Guilde Culinaire, from chef Michael Rathbeger’s flawless hosomaki and Japanese knife in the upper left to my own handiwork in progress making California rolls, Kamikaze futomakis (invented in Montreal and not Japan! ), etc. Today sushi counters can be found in every corner of the city, which is surprising if not worrisome. How can there be so many fresh fish in a city where good fishmongers are not a dime a dozen? Hum. 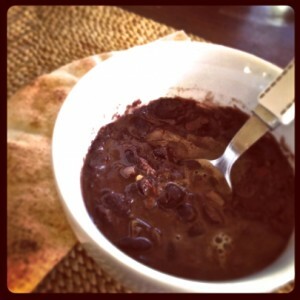 What I like about cooking classes like the ones offered at La Guilde Culinaire? 1. Teachers are passionate professionals who live for food. 2. You are surrounded by foodies like you which makes it easier to connect and establish rapport. 3. Classes are hands-on: the chef first shows you a recipe or technique, then expects you to try your hand at it, a very useful exercise when it comes to sushi making. 4. 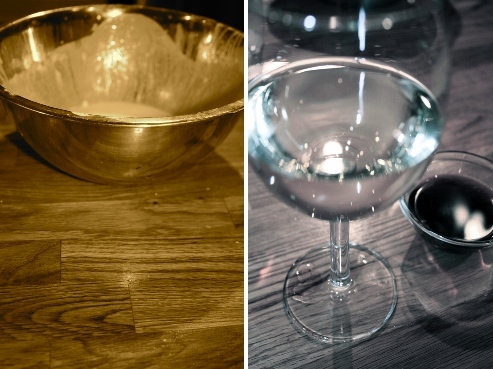 You get to eat the food, either as you go or at the end, with good wine if you are lucky. So really it’s like dining out with fringe benefits. 5. You leave with good recipes and/or good addresses to practice what you learned at home. So with Christmas around the corner, why not give foodie friends of yours a gift they will truly appreciate? They’ll thank you (and me) for it. How do they make those tempura breadcrumbs so popular in futomakis? First you mix tempura batter with water (left pix), then carefully sprinkle with a flick of your fingertips into a hot fryer. They should be ready in seconds. Although a very good brand generally, avoid Kikkoman tempura for this or you will get very dark, oil-soaked crumbs. In good Japanese restaurants, they simply “recycle” bits and pieces of tempura left floating on the surface after frying other foods. Making miso soup on the left, and tamago, Japanese sweet omelet, on the right. After seeing tamago made, you acquire deep respect for this simple omelet, a good introduction to the world of sushi if your picky eater likes eggs. Although Chef Rathberger was more careful, never letting the egg brown or break so that the final multilayered omelet resembled flaky pastry, for the basic technique, see this YouTube video. 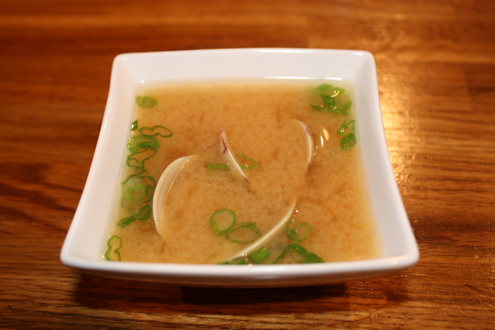 As for miso, the darker the colour, the more pronounced its taste. 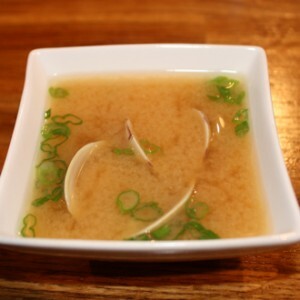 I learned that being fermented, miso does NOT need to be refrigerated. Who knew. 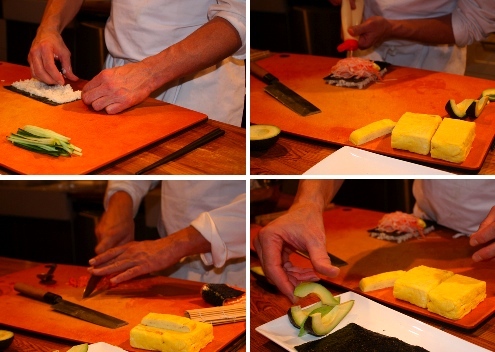 Top left: The trick to adding rice is to work quickly so the nori (toasted algae sheet) does not become soggy. For aesthetics only, apply rice to the dull side of nori, so the shiny side faces out. Top right: If possible, use Japanese Kewpie mayonnaise in makis. Made with rice vinegar, it is best suited to the taste profile. 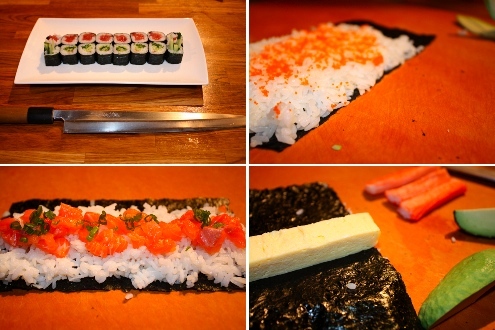 Bottom left: If perfect slices are not necessary, remove salmon flesh from skin by scraping away with a large spoon, then fine dice with your knife. Bottom right: How to tell if avocado is ripen to perfection for those California rolls? The skin around the stem at the top should give in slightly when pressed with your thumb, much like pears. When the body of the avocado is soft, then the flesh is too ripe. Want to impress your guests? 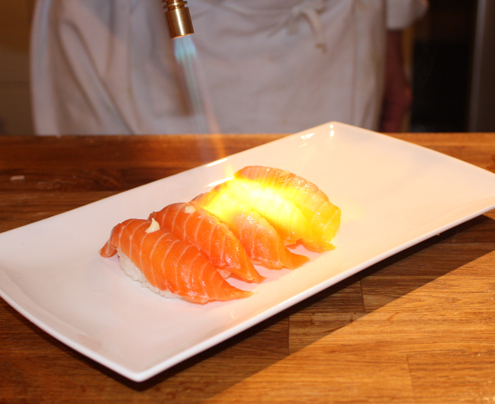 Trending among sushi chefs, salmon nigiri is smeared with a touch of Kewpie mayonnaise, then blowtorched on top for an original hot-cold bite. One of the perks of cooking schools is leaving with killer recipes, like this miso soup graciously provided by La Guilde Culinaire and sushi chef Michael Rathberger. 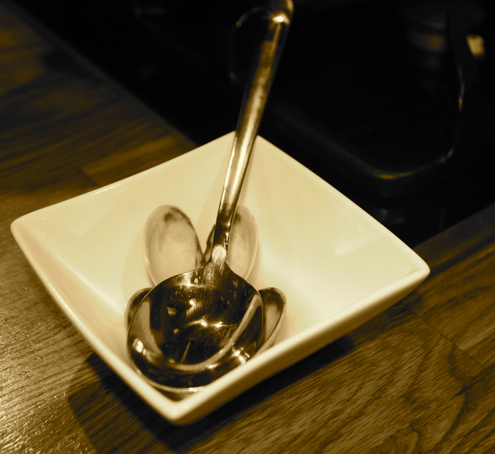 Although miso is now served at the beginning of the meal like any soup, the traditional way in Japan is to close with it. Who knew. 1. Bring water to a boil in a pot. Place bonito flakes in a metal strainer and swirl through boiling water, letting steep until water turns a clear, pale yellow. The resulting “fish broth” is what Japanese call Dashi. Remove flakes. 2. Put pot over high heat. Whisk in miso paste, adding until you reach the taste you like best. 3. Over the pot, compress ginger in your hand, letting juice run between your fingers and into the soup. You should be able to extract around 2.5 ml (1/2 tsp) ginger juice. 4. Place clams into the pan. Cover pot and cook soup until clams open. Discard any clam that remains closed. 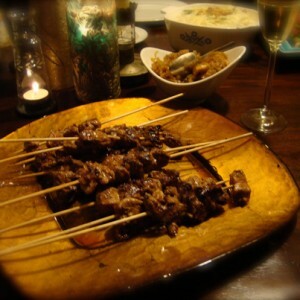 Serve garnished with green onion.